He brought his girlfriend to Los Angeles with his family. 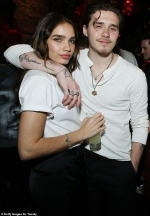 And Brooklyn Beckham looked very cosy with his ladylove Hana Cross at the Twenty party at TAO Los Angeles, in California on Tuesday. The aspiring photographer, 20, draped his heavily inked arm over the 21-year-old model's shoulder to bring her closer together to him.